The Perth Mint has produced a beautiful set of 2011 Celebrate Australia $1 coins that portray scenes from World Heritage Areas across Australia. 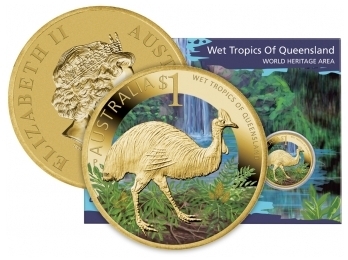 The Wet Tropics coin features the Southern Cassowary with a backdrop of a waterfall and native Burrawang Palms. Coins can be purchased in commemorative presentation folders from Australia Post offices for $14.95. We look forward to seeing the range of Dollarius casuarius johnsonii expand across the country! This entry was posted in World Heritage and tagged cassowaries, Casuarius casuarius johnsonii, coins, Southern Cassowary, World Heritage by cassowaryrecoveryteam. Bookmark the permalink.